7. A light-emitting diode, or LED, is a type of solid-state lighting that uses a semiconductor to convert electricity into light. Today’s LED bulbs can be six-seven times more energy efficient than conventional incandescent lights and cut energy use by more than 80 percent. 6. Good-quality LED bulbs can have a useful life of 25,000 hours or more — meaning they can last more than 25 times longer than traditional light bulbs. That is a life of more than three years if run 24 hours a day, seven days a week. 5. Unlike incandescent bulbs — which release 90 percent of their energy as heat — LEDs use energy far more efficiently with little wasted heat. 4. From traffic lights and vehicle brake lights to TVs and display cases, LEDs are used in a wide range of applications because of their unique characteristics, which include compact size, ease of maintenance, resistance to breakage, and the ability to focus the light in a single direction instead of having it go every which way. 3. LEDs contain no mercury, and a recent Energy Department study determined that LEDs have a much smaller environmental impact than incandescent bulbs. 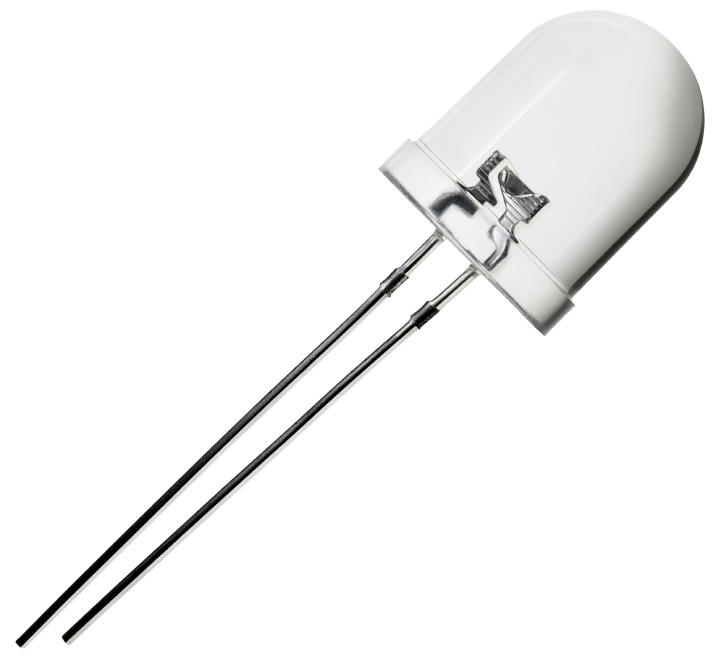 They also have an edge over compact fluorescent lights (CFLs) that’s expected to grow over the next few years as LED technology continues its steady improvement. 2. The first visible-spectrum LED was invented by Nick Holonyak Jr., while working for GE in 1962. Since then, the technology has rapidly advanced and costs have dropped tremendously, making LEDs a viable lighting solution. Between 2011 and 2012, global sales of LED replacement bulbs increased by 22 percent while the cost of a 60-watt equivalent LED bulb fell by nearly 40 percent. By 2030, it’s estimated that LEDs will account for 75 percent of all lighting sales. 1. In 2012, about 49 million LEDs were installed in the U.S. — saving about $675 million in annual energy costs. Switching entirely to LED lights over the next two decades could save the United States $250 billion in energy costs, reduce electricity consumption for lighting by nearly 50 percent and avoid 1,800 million metric tons of carbon emissions. After four delightful years of college in Boston, my whole crew had no intentions of leaving any time soon. The best plan for us was to get some jobs in the city and hunker down together in Southie while we waited for our lives to happen. It was 1997, the same year that “Goodwill Hunting,” starring Matt Damon, Ben Affleck, Robin Williams and others took home a pair of Academy Awards. In the Hollywood version, Williams (a therapist) has Damon (Will Hunting) by the collar to make sure he was listening to him repeatedly saying, “It’s not your fault … It’s not your fault,” referring to the painful, troubled childhood that Damon’s character endured. And while I would never dream of wrinkling Uncle Pete’s collar, we did have cause for a similar talk last year at our annual family Christmas gala hosted at his palatial custom home featuring oversized windows everywhere that let in majestic views of the mighty Atlantic as it thunders away at the rocky coast of Portland, Maine. The Murphy side gathers at Uncle Pete’s classic, coastal Maine luxury estate at least once a year. And every year the place seems just a bit more decadent. Uncle Pete seems is constantly putting the wraps on another home improvement project in time for the holiday season (read winter). In fact, it was last year’s kitchen remodel that created enough space to design a completely new custom guest bath that led to our far-less animated “Goodwill Hunting” moment. In fairness, Uncle Pete has an impeccable eye for classic, modern design, and he likes to stay current. We both share a great appreciation for custom tile design. Naturally, he couldn’t wait to show me the guest bath walls that he had surfaced with handcrafted ceramic tiles. For the new guest shower Uncle Pete selected a custom blend of glass mosaic tile for all three walls. When my eyes finally had a chance to focus on the shower floor I nearly fainted on the spot. There it was, taunting me from its clumsy position right smack-dab in the middle of my Uncle Pete’s brand new full guest bath was another outdated round-center drain. My heart sunk right down to the natural marble floor the second I saw it. Not only that, I knew exactly how it got there in the first place. That’s because there’s only one right answer to that question. Obviously, Uncle Pete had yet to come across a modern design custom shower featuring a decorative stainless steel linear channel drain. 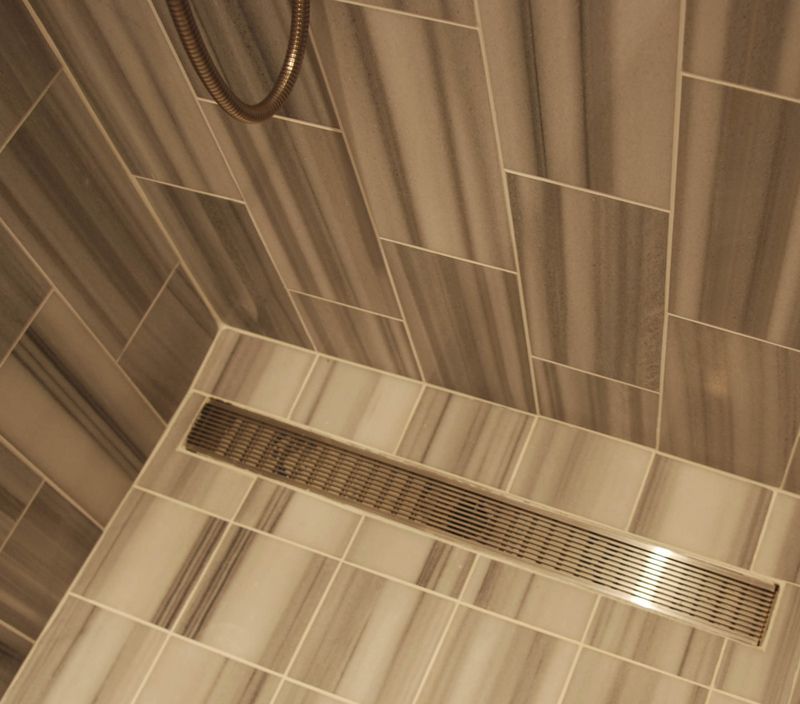 The minute you discover decorative linear shower drains there’s just no looking back – ever. That statement is supported by the explosive growth and demand for linear drains in private homes like Uncle Pete’s, as well as five-star landmarks of hospitality such as The Four Seasons flagship Boston location. 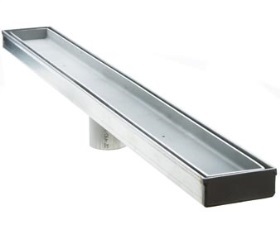 And while the linear drain category is still relatively new in the United States, companies like LUXE Linear Drains in Atlanta already offer a complete collection of architectural-grade, 100 percent stainless steel decorative grate patterned linear drains, linear tile insert drains and decorative 5” x 5” square replacement drains with inserts to match. 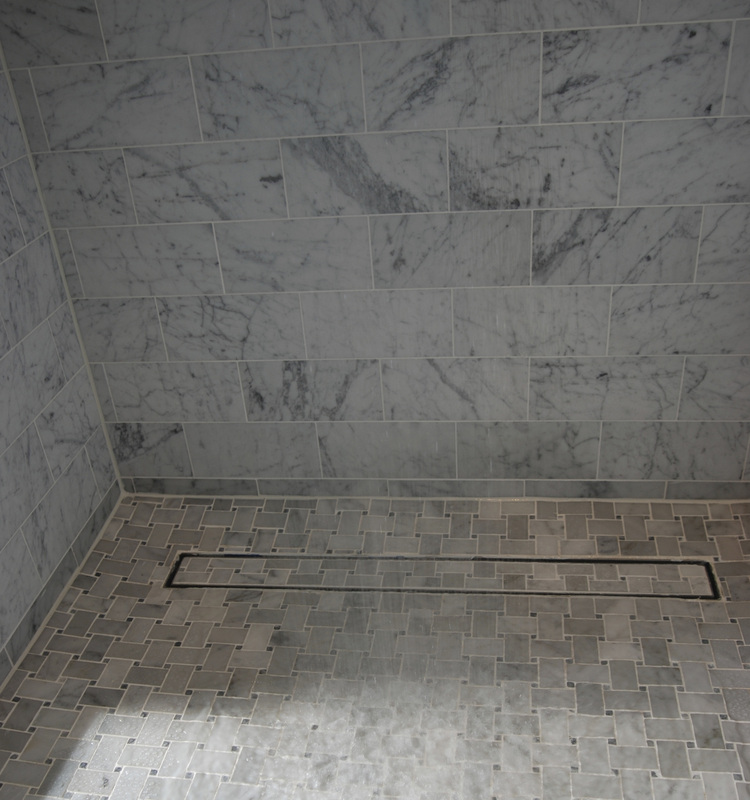 Ask MODA Floors & Interiors for more information on LUXE Linear Drains. LUXE Linear Drains: Joe Phillips, President of LUXE Linear Drains, P.O. Box 8064, Atlanta, GA 31106. Eric Carson is the Director of Blueprint Global Media, a full-service public relations and marketing agency dedicated to architecturally-specified building products and projects. Remodeling? How do you Live? How you live in your home plays an important role when you’re selecting the color, design and products you choose when making a home improvement decision. Here are some questions to consider. How many people will be living in your home? In which rooms will your children spend most of their time? Do you have an extended family member living with you? Do you or a family member have any special needs such as wheelchair accessibility? What overall atmosphere would you like to create in your home? Do you like to entertain in your home? Are you planning for a room or space to be used as a home office, home gym or craft/art room? Will you purchase new furniture for your remodeling project? Are you interested in products that are easy to maintain? Is the resale value of your home a consideration? Have you determined a budget for your project?